Another WIP this week. First mentioned on the blog here, nearly 2 years ago. An homage to my grandmother's one-and-only-quilt-she-made (shown here) that I inherited, re-quilted and absolutely cherish. Another great scrappy project. All paper pieced and hand stitched. Each hexagon measures 1 inch along each side. I have 14 more flowers to make, white 'borders' to tie them all together and also some work to do on the edges to straighten them up a little. And that's before I've even begun to think about quilting (which I plan to do by hand). This is most definitely my slowest stitching project but a great one to pick up when I'm running out the door to Perle 8's and don't want to lug around a sewing machine. Also great for taking on holidays, or even having some piecework to keep in my bag for those moments when the craft 'itch' takes hold and I'm out and about! Do you have a portable project like this one that you keep on hand? What is your 'go-to' slow crafting project? What a fun quilt. I'm glad you're taking your time and enjoying the process. 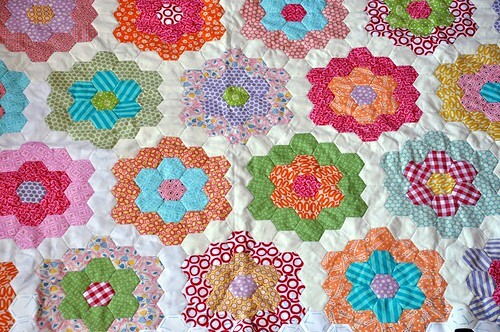 Love your hexies and the inspiration quilt too. My current go to project would be the Brigitte Giblin 13 panel hexagons, but I always keep some paper piecing in my handbag..just in case! I'm just sat here with a bit of hand stitching, and to be honest I'm not thrilled!! with the summer of love quilt. I bet it wont last though. Your colors are wonderful! Love the white border in there too. My hats off to you! Hand quilting??? A quilt that big? You are the woman! I look forward to seeing it in real life. It is truly beautiful. I love, love it . Your project is looking great. Hexies are the easiest and best travelling companions. Mine come to school every day and even 15 minutes of free time is fine to get some stitches done. I've been working on a hexagon quilt for 6 or 7 years. I might be disappointed once I'm finished! Andi, this is absolutely gorgeous!!! 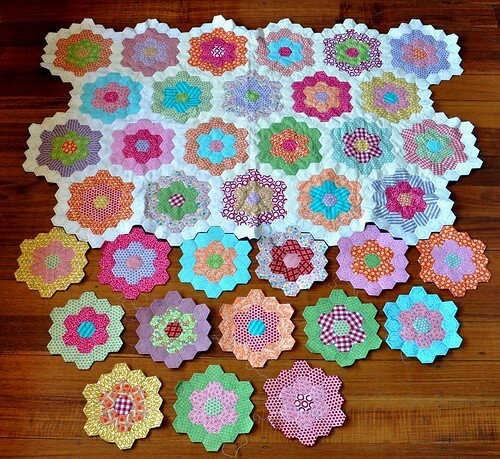 I never thought about doing a hexie flower garden, but this is fabulous. My portable project is my own collection of hexies, plus I started doing the Frosted Pumpkin Stitchery's Fruit of the Month cross stitch. Both great projects for my lunch hour! I'm loving your hexagons, the colours are very cheerful. Of course you know I've been bitten by the same bug too but I see it as a long termer. Absolutely beautiful .. I love your hexagon quilt. right now my slow-stitching project is my aunt millie's garden hand applique project. it's not really portable (it requires a table), so for car and other on-the-go stitching, i'm going to be starting another hexagon project with my scraps. someday i'll order those hexagon templates from paper pieces. 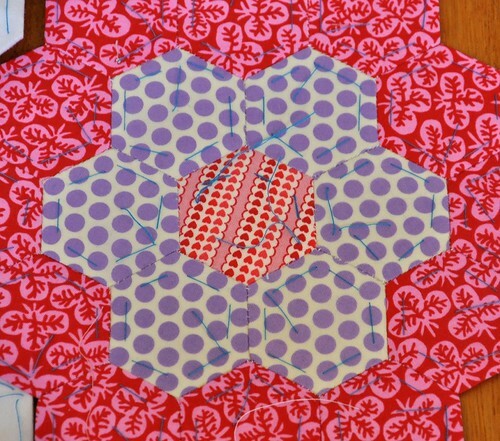 i currently have a whole slew of the 3" hexagons, but this time i want to use 1". I have started...and not finished but given away...the GFG twice. I love the pattern and I love yours! I will vicariously be watching the progress on yours. If I ever start one again, it will be by machine! I don't have the patience for hand piecing. I'm so glad others enjoy what I cannot do so that I can enjoy watching their progress! Its beautiful. I love the way the white borders bring it all together. Can't beat hexies for a slow-stitching project. I've just finished doing straight white borders on my 2-inch hexie charm quilt. I sewed them on by hand because I've already pieced (and quilted the main part) by hand. Now I'll hand sew some binding on. And then I think I'll start on a one-inch flower garden slow burn! Because it's so great to have something slow on the go. Yours is looking just divine. 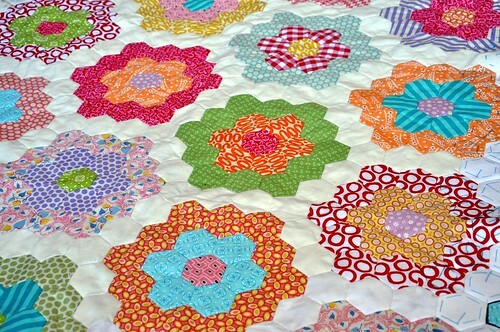 your hexie quilt is just gorgeous, as is your grandmothers flowers quilt. What a treasure that you received it and re quilted it . Hi.. hopin you will be my new, good friend.... I'm making the Grandmother flower garden.... and your color scheme is what I want..